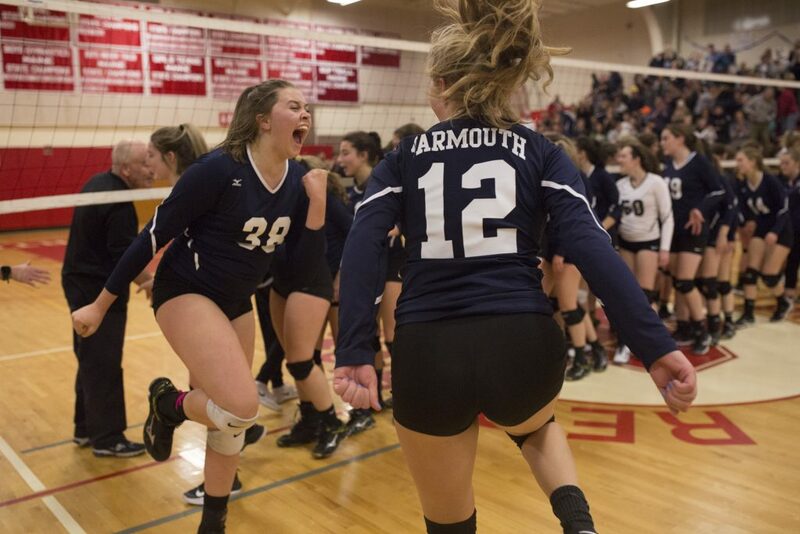 Yarmouth players Maggie Murray (38) and Avery Dube (12) celebrate after beating Cape Elizabeth to win the Class B volleyball state championship at South Portland High on Friday. Yarmouth won 3-2. 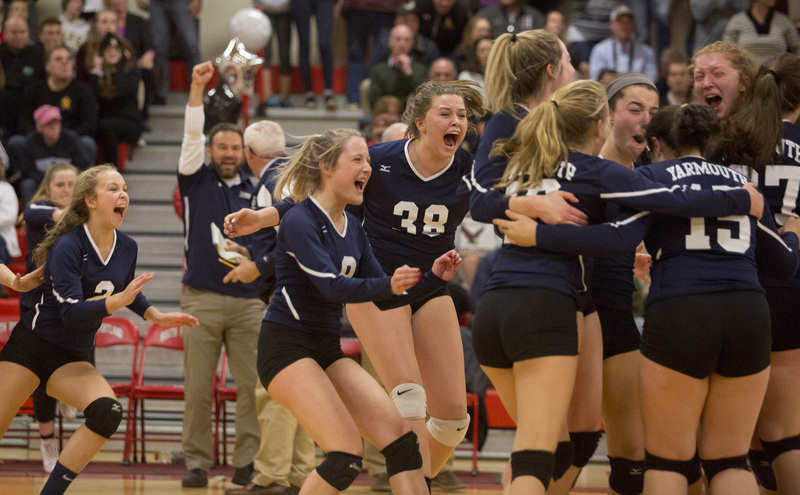 Yarmouth players celebrate after beating Cape Elizabeth to win the Class B volleyball state championship at South Portland High on Friday. Yarmouth won 3-2. 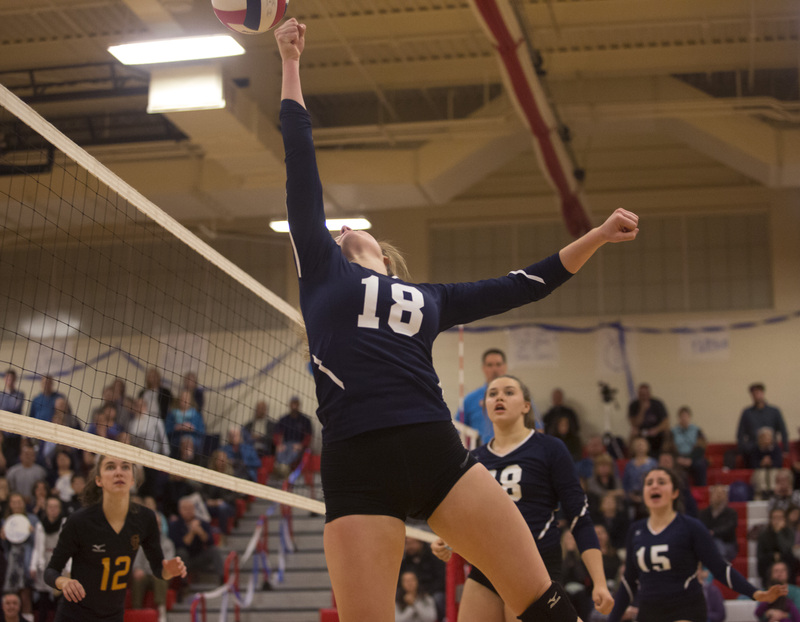 Yarmouth sophomore Kaitlyn Bennett (18) saves the ball with a backwards bump of her first during the Class B volleyball state championship against Cape Elizabeth at South Portland High on Friday,. 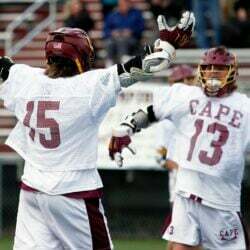 Yarmouth beat Cape 3-2. 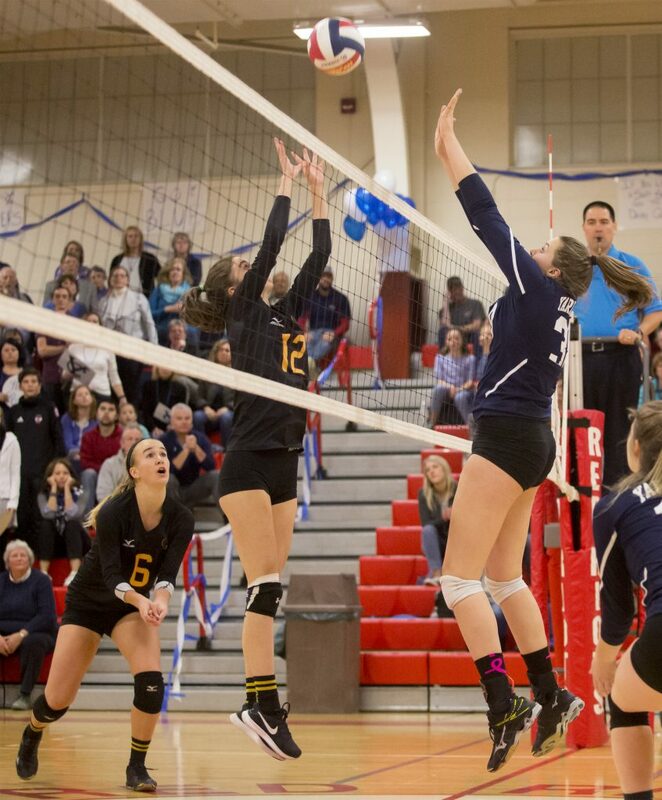 Cape Elizabeth senior Brooke Harvey (12) and Yarmouth sophomore Maggie Murray (38) meet at the net during the Class B volleyball state championship at South Portland High on Friday. Yarmouth beat Cape 3-2. 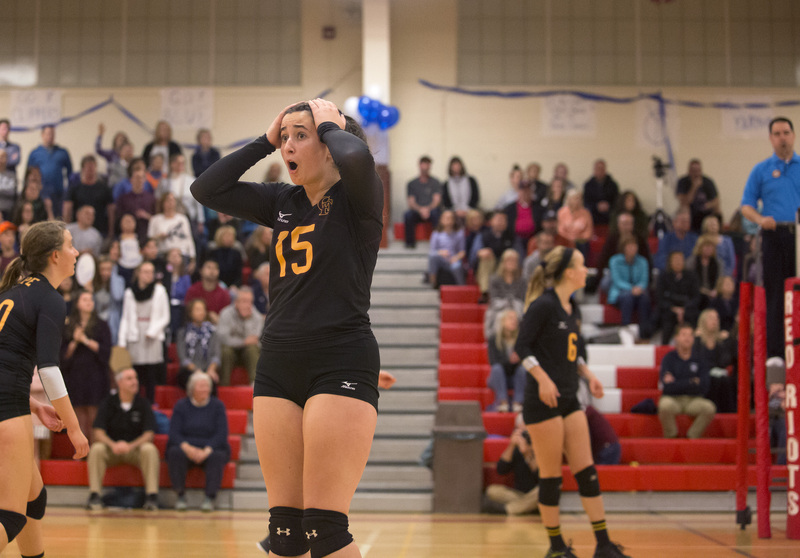 Cape Elizabeth Cape Elizabeth senior Jessie Robicheaw (15) reacts to a call from the referees in the final match of the game against Yarmouth during the Class B volleyball state championship at South Portland High on Friday. Yarmouth beat Cape 3-2. 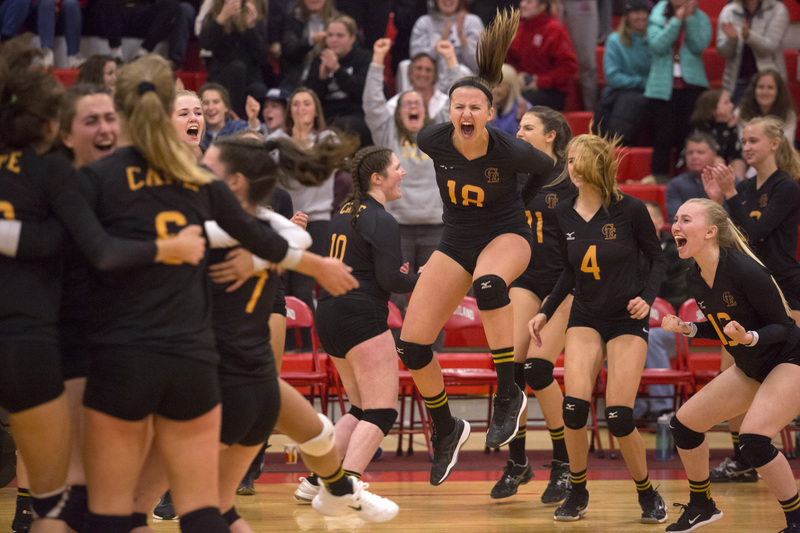 Cape Elizabeth players celebrate winning the third match of the game, keeping their team in the ring for the state championship against Yarmouth during the Class B volleyball state championship at South Portland High on Friday. 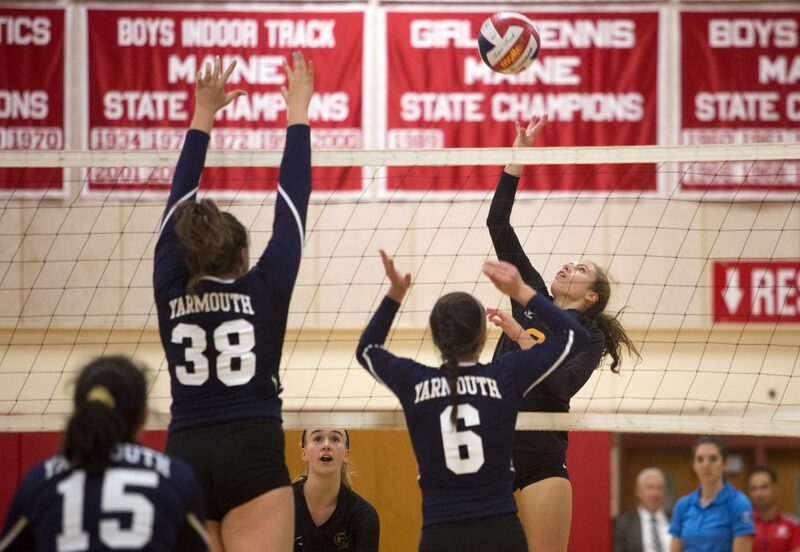 Yarmouth went on to beat Cape 3-2. 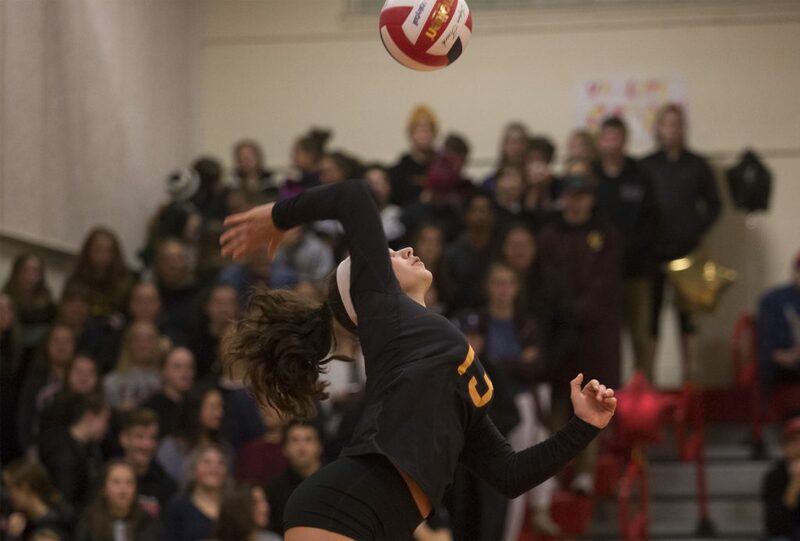 Cape Elizabeth sophomore, and co-captain of the team, Julia Torre (13) serves the ball over to Yarmouth during the third match of game, which Cape won, during the Class B volleyball state championship at South Portland High on Friday. Yarmouth beat Cape 3-2. Cape Elizabeth junior Jaya McClure (3) hits the ball over the net while Yarmouth sophomore Maggie Murray (38) and senior Marie LeBlanc (6) jump up to block it during the Class B volleyball state championship at South Portland High on Friday. Yarmouth beat Cape 3-2. 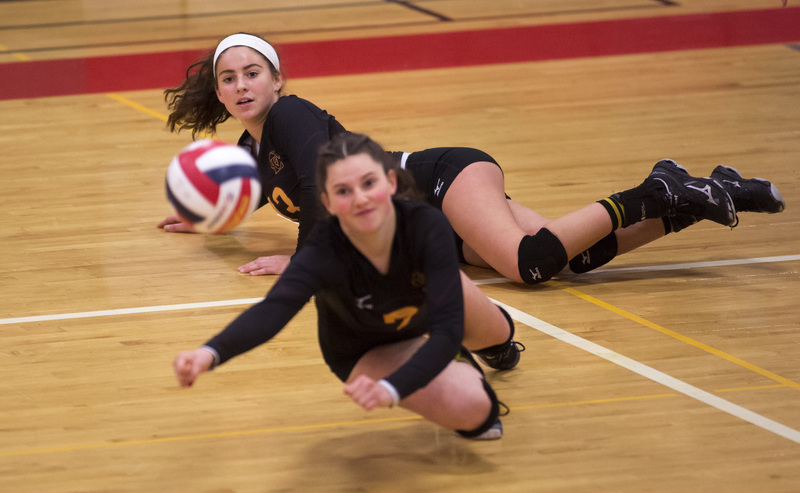 Cape Elizabeth sophomore Julia Torre (13) looks back to see if her teammate sophomore Aerin Manning (7) will make it to the ball she saved from out of bounds during their game against Yarmouth in the Class B volleyball state championship on Friday at South Portland High on Friday. Yarmouth beat Cape 3-2. 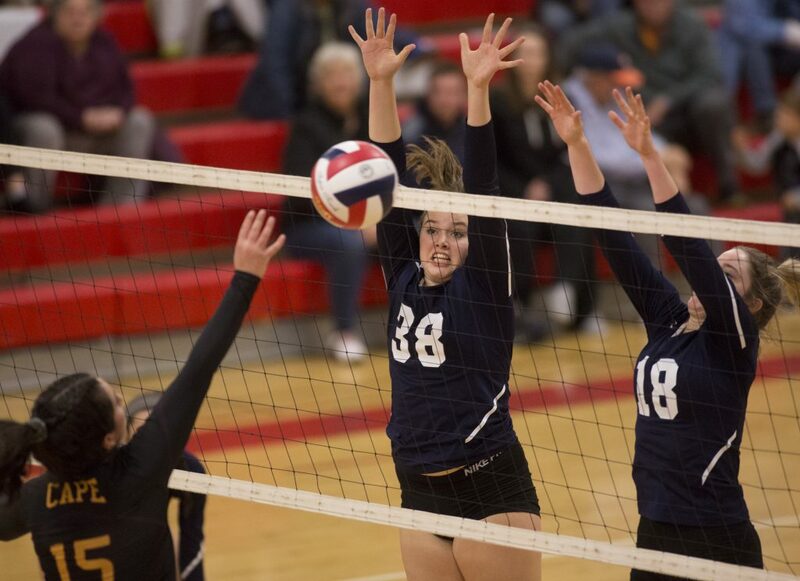 Yarmouth sophomore Maggie Murray (38) and sophomore Kaitlyn Bennett (18) block a tip over the net from Cape Elizabeth senior Jessie Robicheaw (15) during the Class B volleyball state championship at South Portland High on Friday, Yarmouth beat Cape 3-2. 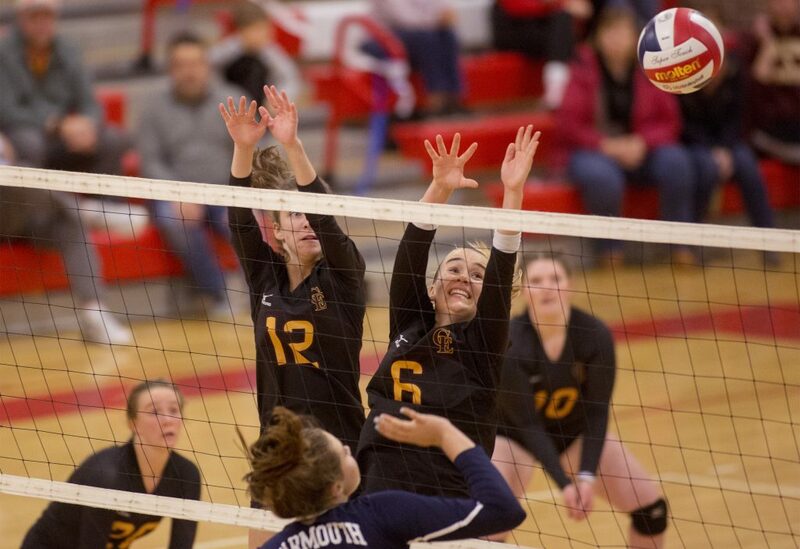 Cape Elizabeth seniors Megan Connelly (6) and Brooke Harvey (12) try to block a Yarmouth ball during the Class B volleyball state championship at South Portland High. Yarmouth beat Cape 3-2. 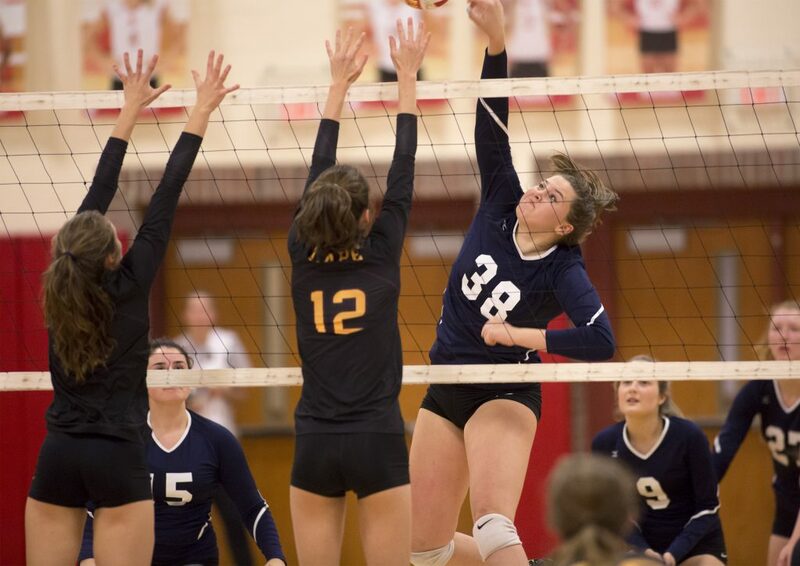 Yarmouth sophomore Maggie Murray (38) hits the ball over the net past Cape Elizabeth players senior Brooke Harvey (12) and junior Jaya McClure (3) during the Class B volleyball state championship at South Portland High on Friday. Yarmouth beat Cape 3-2. 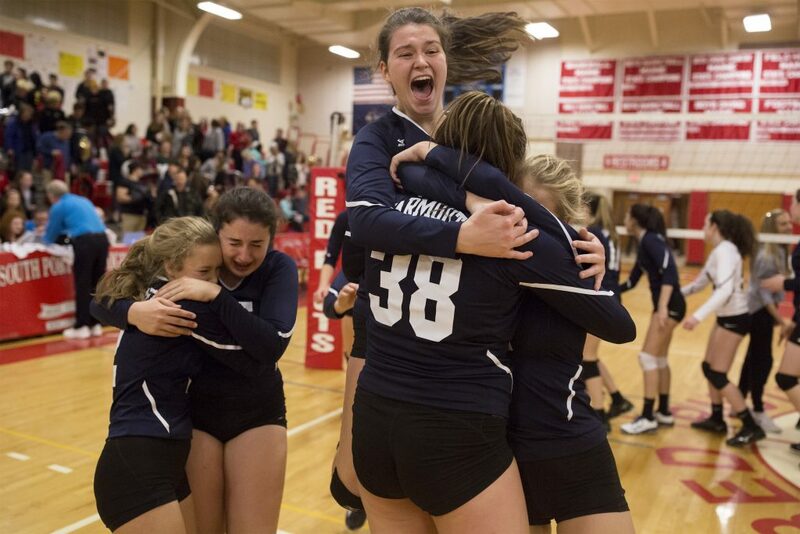 Yarmouth High players celebrate after beating Cape Elizabeth to win the Class B volleyball state championship at South Portland High on Friday night. Yarmouth won 3-2. 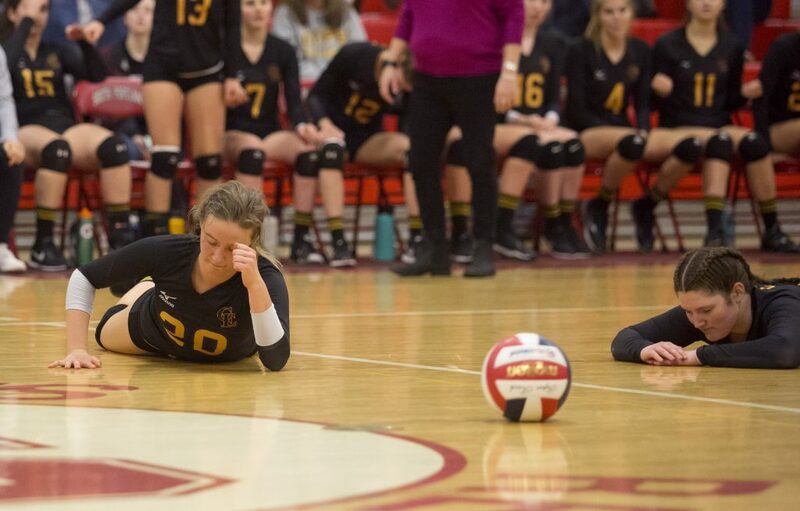 Cape Elizabeth junior Corina Page (20), left, and senior Kalie Manning (10) lay for the moment on the ground after Yarmouth scored their final point to win the the Class B volleyball state championship at South Portland High on Friday,. 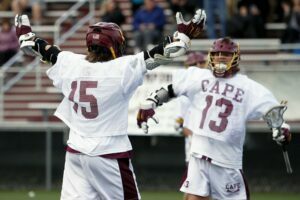 Yarmouth beat Cape 3-2.